TAKE TO THE WATER ANY WAY YOU WANT. 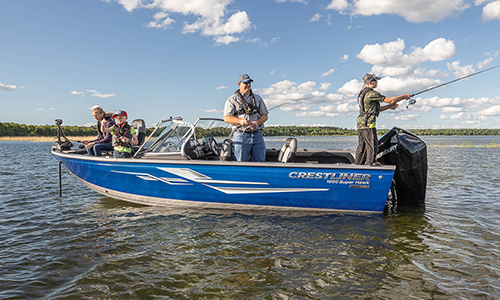 The Fish & Sport lineup of Crestliner boats is as powerful as it is versatile. Maybe you like to fish, but your family loves to ski and tube. Now you have options that can fulfill both interests at a high level. The Sportfish and Super Hawk boast ample seating in the bow as sport boats with optional pylons for safe rope attachment. When you want to transition to fishing, convert the bowrider to a fishing platform in seconds, pull a rod from the rod locker, and utilize one of the bow or stern livewells to store your catch. So, no matter what you choose to do with your day on the water, these boats will make it memorable. The Crestliner Sportfish is our premium, category-leading model that puts serious angling and serious family fun front and center. With premium amenities like a feature-rich console, pro seats and a high horsepower rating, the Sportfish model will deliver an impressive experience on the water for every passenger and angler. The Super Hawk is defined by impressive versatility and fishing power from bow to stern. With an aerated stern livewell to store your catch, or industry-leading Mercury power taking tubing to the next level, the Super Hawk is designed to leave you looking forward to every ride, season after season, year after year. Crestliner Fish & Sport boats have space for everything you need. And from bow to stern all of it will be within reach so you can confidently enjoy the day. There is in-floor storage for any watersports gear or rods you want to bring with you. All of it is placed intuitively throughout the boat so you spend less time shuffling through storage compartments and more time enjoying the water. Our Fish & Ski boats feature premium console designs that come with chrome gauges, rocker switches, and plenty of space for all sizes of electronics. The conversion bow platform allows you to flip between comfortable seating for three people and a full deck for fishing. With livewells in the bow and stern, no matter where you cast from, you’ll have a place within reach to keep your catch fresh. These factors combine to keep every angler at the peak of their game. Every boat package in the Fish & Sport category comes standard with a Mercury engine. 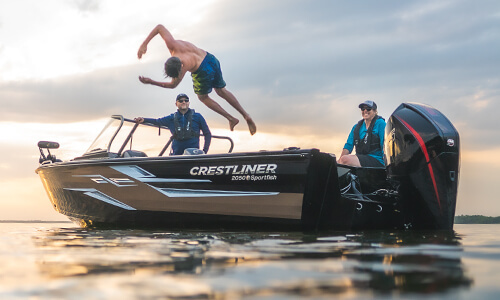 Their industry-leading power combined with Crestliner’s signature all-welded hull means you can reach just about anywhere on the water to drop a line. And its power you can feel anytime you transform your boat from angling to skiing. Pairing Mercury with your Crestliner means there are no boats more durable and powerful out on the water. Thanks to our meticulous welding process and premium-grade aluminum, Crestliner has become synonymous with strength. Every hull is all-welded to create a one-piece bonded hull that delivers unmatched strength and durability. We also integrate a thick extruded full-length keel from bow to stern for added protection and boat control at any speed. The end result of this process is an award-winning, top-performing boat that will last for generations. Crestliner and Mercury form a potent on-the-water combination that stands the test of time. See how a premium outboard can amplify a premium fishing experience.